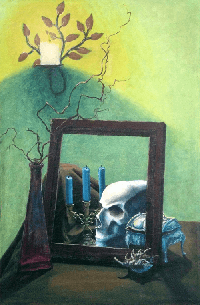 In 1999 I discovered the vanitas style and something about it struck me. I don’t know if it was the scientific detachment of macabre imagery or the matter-of-factness about death. Either way, I felt compelled to examine it. Faced with the challenge to capture a still life yet include something from imagination, I took the opportunity to explore the theme. The movement itself built on reflecting back at the viewer both the transience of life and the futility of resisting death. Vanitas imagery is laden with symbolism referencing the ephemeral nature of life. I took away a different lesson. Live every day as though it may be your last. Make the most of the time you have for you do not know when you may be called. ​S​​et in among an old picture frame and jewelry box, I discovered my token of death: a human skull, culled from my imagination and altering the mood of the tableau from simply nostalgic to somehow fatalistic, reminding us to make the best of this singular opportunity we have to live. Vanitas #1 is owned by a private collector and is no longer available. For those of you who ever asked what my tattoo cost me and heard, “I traded it for a painting,” well, this is that painting.